This was the first ghost hunt that we held at Rye Castle since the building work has been completed. The location has always been one of our favourites since activity has often been strange and unexplainable but this ghost hunt was exceptionally active. My group started on the first floor of the Keep and within a matter of minutes after everyone had settled down we were joined by a male spirit energy called Marquis de Rocforte, who was French and aged in his mid-50s wearing a purple jacket (three quarter length) with brass buttons, white shirt, white stockings and black shoes with buckles, he also wore a hat similar to an Admiral Bicorn Hat. He looked to be an important person. We have since found out that this uniform would have been worn in the Napoleonic era by “Payeur Général de la Garde”. 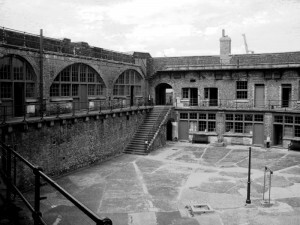 There were also two children aged about 10 years old playing noughts and crosses in one of the cells. Levels of KII (EMF – Electro Magnetic Fields) were also very high with sporadic spikes. One of the guests (Audrey) was French so she started to ask questions in French and I relayed his answers, after several questions Marquis de Rocforte tipped his hat in a very Royal fashion. Audrey noted that her arm felt as if it was being held and many of the guests also noted that she was standing in an awkward way. Audrey also felt as if something was being pressed into her hand, like a coin. Many guests could smell cannabis and near to Audrey the smell of stale alcohol could be smelt by some. The more we talked about the spirit energy the more the KII meter showed high levels of EMF. Another guest Michelle felt a touch on her shoulder whilst she was standing in one of the cells. I decided to finish the session with a séance to try to get some of the other guests to feel the spirit energies, however the only person who seemed to be affected in a painful way was me, as my arms were moved into some very painful positions, other guests were gently swayed and pushed. The second session, we would normally swap groups so that all the guests spend time with all of the team, but because the first group to the Woman’s Tower had experienced something unusual we decided not to swap the groups to see if my group felt the same sensations as the first. That way both groups were going into a new location “blind”. As soon as we entered the Woman’s Tower it had a strange oppressive feeling, we have visited this location several times before but this was the first time I have felt this heavy feeling. Within a matter of minutes everyone in the group was either swaying or rocking gently. It didn’t seem to matter where people stood the feelings were the same. This has never happened here before. Some of the guests who were standing in front of the window (with their backs to the window) were pulled backwards towards the window, those guests who had a wall behind them were pulled backwards into the wall. It was a very strange sensation as this is the area that had recently undergone building work and the floor was perfectly level. I was standing near the door and on more than one occasion I was pushed into the door. Quite early on in the session we all heard a “Whooo” sound, which because of the way the place is orientated this noise could not have come from outside the Ypres Tower grounds, it had to come from within the courtyard and no-one was in the courtyard. I was describing a female spirit energy to the group who had just “popped her head in” her name was Daisy, approximately 40 years old who had piercing eyes although the left hand side of her face was disfigured (either by a stroke or a scar). Whilst I was describing her Carl (GHE team) suddenly exclaimed he had just seen a face, below is his account of what he saw. The room was nearly in total darkness with only a little light coming in through the window from the moon. As I looked in the direction of the doorway a women appeared at the doorway and took three steps in to the room and looked straight at me for a moment and then stepped back out of the doorway out of view. I was taken a little by surprise and couldn’t really talk for a moment and I was trying to get Steve’s attention and when I finally did, I stuttered that I had just seen a women walk into the room. After a moment I started to calm down and explained in more detail what I had seen. The woman was about 5ft6 to 5ft8 in height and had very wild looking white hair. She had very gaunt face and you could clearly see her cheek bones sticking out, she had dark eyes which were set back in to her face, her expression on her face was very strange which scared me a little. She was wearing a white smock which was very dirty. The sleeves were short and it came down to her knees, it was all ripped and in tatters. The women had nothing on her feet and her skin was pale and dirty, her nails on both her fingers and feet were dirty and long. When she moved she did not make any sound. No one heard anyone or anything come up or down the stairs, which are normal so noisy is anyone moves on them. It was like looking at someone in daylight and she was so clear and solid. I was a little shaky after the experience and took me several hours to recover fully. But with this in mind I can’t wait to go back and investigate again. Just after Carl had seen this, noises could be heard on the staircase and footfalls outside on the gravel to which I stated to the group that it was so loud it must be a person. It was. It was one of the members of the other group who asked that I come with them as they had an issue with one of the guests that needed my urgent attention. As I arrived back at the main Tower one of the guests was being carried out of the building by two people, she was totally oblivious to what was happening and erratically shaking with spasms and fits. This particular guest had something similar happen to her before at this location and on that occasion had to be manhandled out of the Tower, this time she had to be carried out. The guest was being affected by a particularly nasty spirit energy who in the past would have easily murdered women with one hand by strangling them. I decided that we need to move this guest further away from the Tower as the spirit energy was able to use the Tower as a source of energy, further away he would not be able to. The spirit gave me his name as Terry the Terrible, which obviously wasn’t his name. The guest kept repeating the name Frank, even when asked who she came with, the only name she uttered was Frank. All the time she was still shaking violently, although not as bad as when I first arrived on the scene. During this I was administering what I would call emergency healing to push the nasty energy out of the guest, which was working, but as always it takes time. Within 10 minutes the guest was fully back to normal although very shaken and dazed, probably wondering why she was outside on the grass. The guest described the sensation of what it felt like, which in her own words were “like being pushed down inside”. This is typical although thankfully not common of what it feels like when a nasty spirit energy pushes our own energies aside. This is something that I have come across before but thankfully not too often. After this all groups had a break before we embarked on our free session, this is when we let our guests use our equipment and venture throughout the venue to hold their own ghost hunt. I went back to the Woman’s Tower as my session was cut short and I wanted to see if the same spirit energies would do something. On entering the upper floor the now usual swaying and tipsy feeling returned and with the people present I conducted an EVP (Electronic Voice Phenomena a.k.a. ghost voice) experiment. All four recordings had spirit voices in them, but when this was analysed by our experts none of the words spoken could be understood, this is unusual because we can usually identify at least one word, but on this occasion we have four recordings with words, but we cannot understand any of the words. During the EVP experiment Jamie (Guest) had trouble speaking and she sounded completely out of breath, Carl felt unwell (as usual here) and had to leave. Marc (GHE team) who was downstairs heard some random noises which he thought was us, but we weren’t moving or making any noise. When asking for the spirits to make a noise everyone heard mumbling but could not decide on which direction the noise came from and then we all heard something drop, on investigating this, I found a small stone on the middle of a step of the staircase, which I am fairly sure wasn’t there before as I’m sure someone would have noticed it. I joined Marc downstairs to hear some of the noises he was hearing and those noises were odd but neither of us couldn’t decide where or what we were hearing. Jamie (Guest) & Ted (Museum staff) quickly joined us as they said it was too freaky upstairs. A little while later I went back to the Women’s Tower and joined three guests, who had a spirit box (a device that scans the FM radio frequencies in reverse at 100ms) and were trying to get spirit to say something. As soon as I entered the room everyone clearly heard “Steve” on the spirit box. Asking various questions some of which were answered correctly, some were not (especially the number questions e.g. how many people in room). On asking whether the spirit energies would like leave, I requested that they say Bye or Goodbye on the spirit box, we all then heard “Good” “Bye” as two separate words, spoken in a female voice. This ghost hunt was one of the most interesting we have had at this location as the activity seemed to be non-stop and every guest (some more than others) felt real paranormal activity or heard something that they could not explain. The sensations felt in the Women’s Tower were the same for both groups and everyone felt the same sensations and physical movements. Certainly one ghost hunt that we will remember for a long time. We haven’t had a lot of luck with the weather at this venue in 2012. First time it was -10 degrees Celsius back in February, then in April it was just before a thunderstorm, June it was a thunderstorm so fourth time lucky and this was well worth waiting for. We started in the remains of the manor, gave the guests lots of our kit to investigate with and let them roam around. Many guests reported seeing shadows and lights within the near distance trees. I generally stayed put and various groups of people reported different activity in all directions, but the one thing they all commented on was the fact that all felt watched. A male energy by the name of Philip approached, he was a gardener when there was a house at this place, he tipped his hat to me and some of the guests felt his presence. Steve (guest) felt a light touch on his back and the sound of a dog, panting during the phase when the spirit Philip was around. Many guests also reported hearing voices, whispering and whistles in one particular place. Four guests (Andy, Wendy, Marie & Shelley) all heard these sounds as well as the sound of a children’s music box. I then went over to the part to have a look and was met by a Frenchman spirit called Alain. He was about 55 years old and dressed in a smart black suit which had a silver pocket watch attached. He gave me the impression he was from 1900s. The guests that had some of our equipment all had high levels of activity displayed on the various meters. From here we decided to move into the woods to hold a séance, as the last time this proved very successful but due to the heavy rain it was not as enjoyable as it could have been. Once again after finding a suitable spot there were high levels of activity shown on our KII meters and on our ghost communicators. Within a few minutes of us starting a séance a male energy aged in his early 30s approached us, his name was Roger and he was wearing a white shirt and grey trousers and it was impossible to associate him with a period of time, although he wasn’t wearing a tie or hat. Roger was very capable of moving people in various ways and generally pushed and pulled most of the group, starting gently and then as his confidence grew the level of movement increased and some people, especially Phil and Lisa, were manoeuvred into some rather uncomfortable positions. Cold spots were also reported by the guests, mainly behind me as the temperature was a steady 20 degrees Celsius most of the night, these cold spots were felt behind four or five people and it felt like stepping into a freezer. During the séance Andy felt a stick hit his legs and since Carl (GHE Team member) was outside the circle and at the time on the opposite side of Andy went to investigate although Carl could not see a stick anywhere near Andy. After the séance finished Andy found the stick about 14 inches in front of him. After the séance finished, which I concluded after most people apart from two had either felt arm movement or had been pushed by Roger, some of the guests wandered deeper into the woods as they thought they heard voices and noises whilst the séance was taking place. The rest of the guests made their way out of the woods. However those that stayed listening in the woods were soon returning because they heard footfalls in the woods and since no torch light was seen, this scared them. We made our way back to the site of the manor house and conducted an EVP, although when we played the recording back very few anomalies were heard, however once we analysed them we discovered there were quite a few responses, although not all could be interpreted. Once again a very enjoyable ghost hunt and a very productive one with many paranormal occurrences taking place. After we had enjoyed a cup of coffee back at the car park and just before we were about to leave, Carl (team member) saw a “shadow” behind me and exclaimed that it looked too real to be a spirit and so the four of us who were there turned on all our torches to try to see what this was. To our amazement there was a young male (real person, wearing a blue shirt, black top and trousers and had glasses with curly black hair) standing very close to the hedge on the way out of the car park and even when I blinded this person with my torch he failed to move, but just looked down to the ground. All of us decided that this was a very good time to leave as he was probably drunk. As we were driving out of the car park we noticed this same person lying down on the grass beside the road which was really strange. Every time we come here for a ghost hunt something different and interesting happens, either in the woods or near the church. This time however we had both. Around the back of the church (in a field), which on previous occasions has been the scene of some very unusual and paranormal activity, we came across a female energy who would not tell us any personal information, but according to our communication devices we were standing on her grave. Some unusual noises and whistles were also heard by the guests and the Ghost Hunt Events team. Also whilst sat here we used the Ovulus and some words were heard in response to guests questions. There was also a very high level of KII activity as if the energy was walking to and fro from the church. Using our SB7 (a spirit box, which scans the radio frequencies in reverse at 100ms) we all heard “Hello” spoken. As we were walking away from the car park, Stuart & Donna (guests) heard a sound which made them catch up with the rest of us, Stuart described the sound as being a metallic clanking sound, not like keys, but something heavier. We then made our way into the woods, which were as usual very quiet with a distinct lack of animal sounds, which makes hearing any noises that much easier. There was also no wind to speak of either. After setting up a laser grid pointing along the path, many people noticed that some of the lights were being blocked as if someone was walking across the path. Many guests felt unstable on their feet and several complained of swaying which was unusual because the path is generally flat. Also in this spot there were brief periods of high KII activity. Whilst Carl & Marc (Ghost Hunt Events team members) carried out an EVP experiment, I walked further down the path to find a particular spot which on a previous occasion proved to be a rather active place and one in which many of the guests present felt uncomfortable as well as very high levels of spiritual and ghostly activity. After walking the guests to the spot that I had just come from we held a séance to try to get the spirit energies that were present to physically move the guests. We were joined by two energies, one a male energy called Roy who was 67 year old and a local farmer and Francis who was female and about 30 years old. Gentle arm movement was felt by Wendy, Lloyd, Bradley and Stuart (guests) and when I asked for the energies present to push some guests Andy, me, Lloyd and Bradley all felt some gentle pushing. Several of the guests also noted that they thought they could see shadows moving within the woods. During the séance and afterwards Andy was being drawn to an area to the right of where we stood, he kept looking in that direction during the séance and after we finished he had the urge to go to that area. When he got there he felt cold (it was a warm night) and also nauseous. Andy then called me over to see if it was just him. It wasn’t. I too did not feel right in this spot and although I cannot describe exactly how I felt, my head did not feel right, like I had just been shaken violently. At this point Andy had to leave as he was feeling ill, the nausea had got too much. The rest of the group came over and with the communication device we established that this particular spot had been the site of a murder. The energy that was causing all the feelings was a male energy about 14-16 years old and he had been strangled and his body buried in the woods. He did not, or was not able to give a year and the audio recording from this area revealed no voices. Unfortunately the feelings I felt had got the better of my and I too had to leave the area as I was feeling the same sensations that Andy felt. Just before I left the area Donna, Stuart & Wendy all had a metallic taste, which is usually the taste of blood, they too felt the coldness and we all heard voices and footfalls in the direction of the path. But since I had to leave none of them wanted to stay there! Carl also decided that he would investigate the area, but after a few minutes he too came back and reported that he tasted blood and said that the area did not feel right. We decided that this was probably a good time to stop the investigation and made our way back to the Church. Once again a very active and enjoyable ghost hunt with plenty of activity and some very clear EVPs (ghost voices) recorded. Last years ghost hunt at South Foreland lighthouse was excellent however the weather in October was a little bit windy so we were hoping for a better day for June 2012 and because of the tine of year we were able to see France with ease and much of the coastline of Kent as well as the infamous Goodwin Sands where many ships have sunk over the years. Fortunately due to the location there weren’t any noises apart from an occasional announcement from Dover docks which was carried on the wind to interfere with our investigation. After a brief history and tour of the building from the National Trust representative the majority of the group headed into the lower ground floor room, as this was the only room which was completely dark, however myself and Carl (team member) remained outside of this room as we were conducting a special EVP (Electronic Voice Phenomena a.k.a. ghost voice) experiment. The difference being that both Carl & I were wearing our respective hearing amplification equipment which meant that whilst we could hear the other group clearly we could also conduct our own quiet recordings without interrupting the other group. During this session many bangs and tapping sounds heard by both of us were heard. These all sounded like someone on the floor above us but no-one was on that floor. We also heard whispers and voices which once again sounded like someone above us. I however had the sensation that my shirt was being pulled out from behind me, but I did not sense any spirit present at that time, although the other group had asked the spirit with them to do something to either of us. (Their report will follow). When the group had finished in the lower ground floor, myself & Carl ventured into that room, as soon as I took two steps into the room I felt an amazing amount of pain in my right knee, it felt like someone had just kicked my knee. The rest of the group found this very funny as they had asked the spirit that was present to do that to another guest. I had trouble walking for a couple of hours and it hurt every time I went up or down a step. The second session was held in the Control room of the lighthouse; a female energy called Elizabeth came forward and told us that she lived in the lighthouse with her husband who was a keeper. During this session many bangs and knocking was heard by everyone. Marc (team member) went to investigate one of the knocks as it sounded like the outside door and although we were sure it was locked he went to check. As soon as he was outside the room he exclaimed to himself that it felt odd, although we could clearly here him. He later explained that the atmosphere on that part of the staircase felt strange and stagnant. Our third session was once again split; some guests followed me into the lower ground floor and others onto the upper ground floor and control room. We were joined by a male energy called Timmy Sullivan who was about 17 or 18 years old and he presented himself as being a simple person. He had dark short hair and was very slim or skinny and about 5’9”. He gave the year of his passing as 1891. Lots of audible noises were then heard by everyone present, some of the noises sounded like a clock (although there were no clocks in the room) and then just as I thanking Timmy for making a noise we all heard an extremely loud crack right behind me, what this was I have no idea, because nothing in the room was on (there were electrical meters and general lighthouse workings behind me). Tapping on the metallic objects in the room also were repeated back to us as were whistles. One of the guests who was sitting in a chair felt uncomfortable, so she moved to the other side of the room. This corresponds with a male energy who had turned up, he was 55 years old and basically came in swearing at us, although I was the only person who could hear him, but the guests present felt the atmosphere change. Many more noises were heard including a very loud bang which occurred right in front of me. From this point on one of the team entered the room and sat in the chair that the female guest had sat in and within a few minutes he too wasn’t feeling well and had to leave the room. One of the female guest also left the room as she was frightened. I then conducted a series of EVP experiments, during which a number of noises continued, mostly it sounded like someone tapping on the metallic objects in the room. Also during the experiment a guest asked a question but instead of an EVP a loud “tick” was heard, you can hear it at http://youtu.be/PCvRl_LuRfU The tick sound had no obvious explanation as nothing in the room had previously made this noise all night. Once again a very enjoyable ghost hunt with lots of activity. Many Thanks to Janet and the National Trust for making this event run smoothly.